Ottawa’s decision to nationalize the Trans Mountain pipeline project will make it the owner of a spur line that feeds Alberta oil to Washington State’s refineries – and opens up a new front in Canada’s conflict with foes of increased oil capacity. An environmental coalition in Washington State is gearing up to battle the new owner of the pipeline project, saying Kinder Morgan’s pipeline plans include additional capacity to ship oil to their jurisdiction. Tanks are shown at the Kinder Morgan terminal in Edmonton on Tuesday June 5, 2018. A spokesperson in Alberta Premier Rachel Notley’s office said on Wednesday that U.S. opponents of the pipeline simply want to keep Alberta’s oil prices depressed. “Canada needs to know, we will fight this to the end,” Rebecca Ponzio, climate and fossil-fuel program director for the Washington Environmental Council, said in an interview on Wednesday. The coalition, which includes Indigenous tribes in Washington State, said financial disclosure documents issued as part of Kinder Morgan Canada’s initial public offering for the Trans Mountain pipeline expansion project in 2017 are a reason for concern. In those documents, the company indicates the potential to more than double the throughput of the Puget Sound pipeline, boosting its capacity from 240,000 to 500,000 barrels a day (b/d). In 2017, a little more than half of the crude oil flowing through the Trans Mountain pipeline was delivered to the Puget Sound refineries for processing. A company official confirmed the spur line is part of the package Canada has offered to buy. The spur line branches off the Trans Mountain pipeline in the Fraser Valley, running to four Washington State refineries that produce fuel for domestic use. U.S. environmentalists are concerned about proposals to use those refineries as terminals to export crude oil through the Salish Sea – adding to concerns about increased oil tanker traffic that would come with the expansion of the Trans Mountain pipeline from Edmonton to Burnaby. Ms. Ponzio said the Stand Up to Oil coalition has taken on eight proposed oil transportation facilities in the state in the past several years, and defeated every one. Ottawa is already embroiled in a battle with the B.C. government, Vancouver and Burnaby, some First Nations and environmentalists in Canada after announcing its intent to buy the Trans Mountain pipeline from Kinder Morgan for $4.5-billion to take over and complete the expansion. The federal government says it hopes to find a private-sector investor to take over the project, but it will complete the purchase by August if none is found. Alberta Premier Rachel Notley has applauded Ottawa’s offer to take over Trans Mountain, and has said her government would buy the pipeline if necessary to ensure the expansion is completed. A spokesperson in Ms. Notley’s office said on Wednesday that U.S. opponents of the pipeline simply want to keep Alberta’s oil prices depressed. Washington State Governor Jay Inslee has been working closely with environmental organizations to impose new regulations and taxes on the transport of heavy oil through his state. He has sided with the B.C. government in opposing the Kinder Morgan expansion, and his government is fighting the Trump administration to stop expanded offshore oil drilling. Earlier this year, Mr. Inslee refused to grant a permit for what would have been the United States’ largest oil-by-rail terminal. Under state law, Kinder Morgan would not need a new permit to increase the flow of oil through the Puget Sound Pipeline, so long as there is no capital improvement to the line. 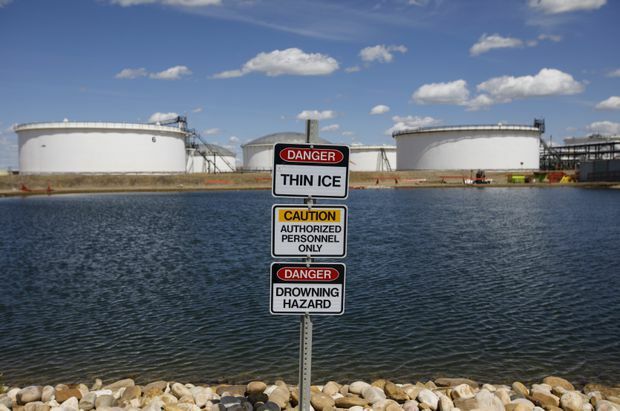 However, a new operator would have to file a new oil spill contingency plan.